Two weeks ago, I had this weekend free and wasn’t planning on traveling anywhere. One of my friends had booked a flight to Barcelona, though, and wanted me to go with her. Although it is a major study abroad trip location, I wasn’t sure I wanted to go because I wasn’t too interested in Spanish culture, which I had been told mainly involves staying out all night. As soon as I stepped off the plane in Barcelona on Wednesday, though, I knew I had made the right choice. Even though it was uncomfortable having to fly on the cheap Ryanair airline four times in four days and having to go through security four times (I had layovers both directions, and Ryanair makes its passengers check in outside of security for each flight), being in Spain for three days was completely worth it. 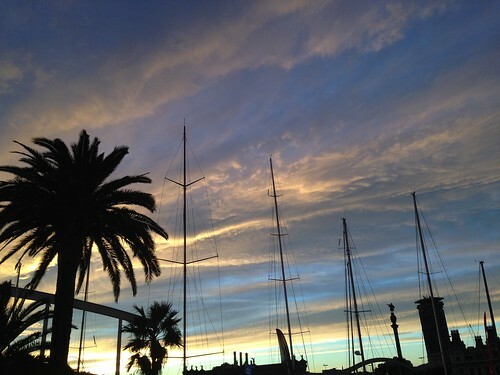 Barcelona is beautiful no matter what, but coming from two months of mostly gray, rainy weather and temperatures of at most 55 degrees, the Mediterranean climate, and being able to wear shorts, seemed absolutely heavenly. The blue sky, palm trees, and 70-degree temperatures (in November!) reminded me of my native California and made me never want to leave. As soon as my friends arrived and we had checked into our hostel, we got on a hop-on, hop-off tour bus (the greatness of which I have come to realize since being in Europe, since they take you everywhere you would want to visit as a tourist) to see two of the most famous parts of Barcelona: the Sagrada Familia and Parc Güell. 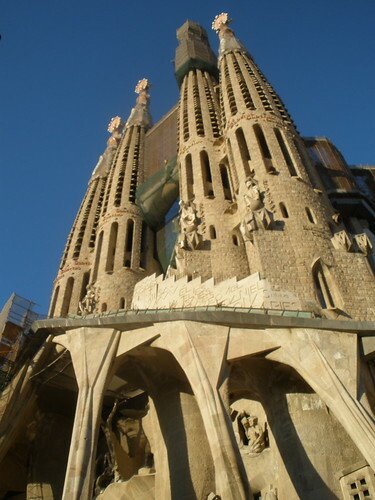 This cathedral and failed planned community, respectively, were both designed by Antoni Gaudí, Barcelona’s most influential modernist architect. So influential, in fact, that I’m pretty sure there was a building he designed on every street we drove down, or at least it seemed that way. 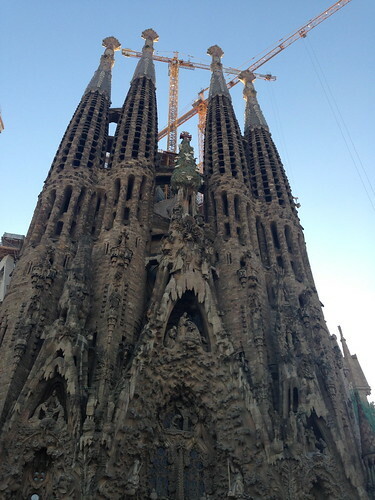 I’ve seen a lot of churches this semester, but none of them are at all like the Sagrada Familia. It’s still under construction, for one thing, because it’s funded by visitor donations, so it was covered in scaffolding and there were people actively working on it while we were there. It’s also stunningly beautiful. I’ve seen amazing pictures of the spires that almost look like they’re covered in barnacles, but it’s even more beautiful in person. The view from the top was of course spectacular, but, this time, I was more impressed by the actual church. 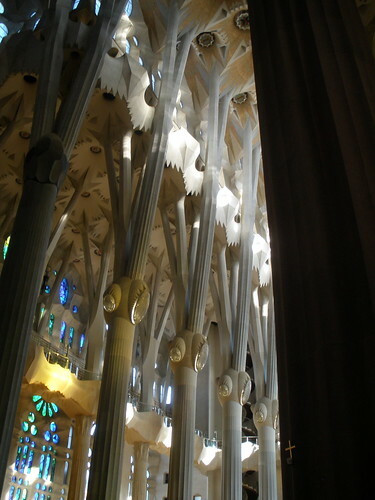 Apparently, Gaudi got all of his inspiration from nature, which explains the forest-like feeling of the inside. The stained glass windows are also more similar to a rainbow than typical stained glass windows, since they progressively change color as you move throughout it. I can’t even imagine how beautiful it will be when it’s finished, since it’s been under construction since the 1880s. 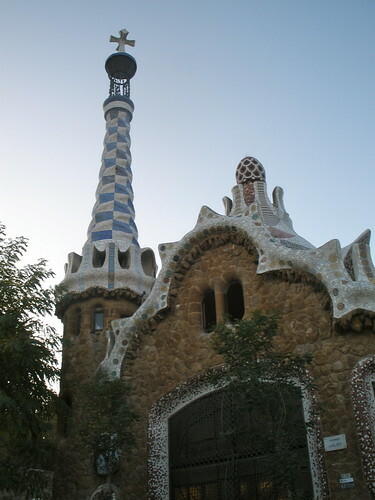 I had never heard of Parc Güell, but a few weeks ago I saw pictures on one of my friend’s Facebook pages that looked like gingerbread houses. Of course, I had to go see them. It turns out Gaudí had designed them as part of a planned suburban community that ultimately failed, but now they’re open for touring. The inside of the two gingerbread-looking houses he did construct are strangely designed and looked a little like something out of a Tim Burton movie, which was interesting, especially since they were designed in the early 1900s. There wasn’t much to see inside the actual park except a pretty panorama of the city, but it was still neat to see more of his work. After we finished seeing the sights on the rest of that tour bus line (we didn’t get off anywhere else because the sun had already set) we went to get tapas for dinner. By the time we were got to the restaurant, it was about 8:30 pm, but we were still some of the first people there. When we were leaving at 11, though, there were people just sitting down to eat. I had heard Spanish culture was like that, but it was still strange to see it happening. 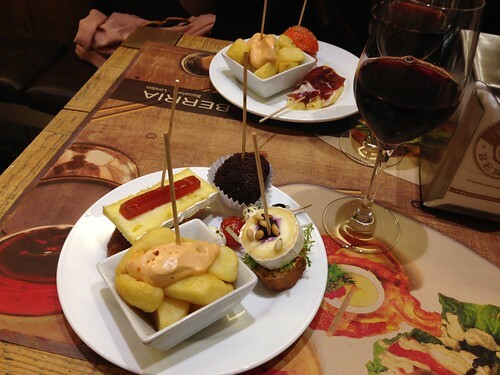 The tapas were delicious, though, as was the sangria. 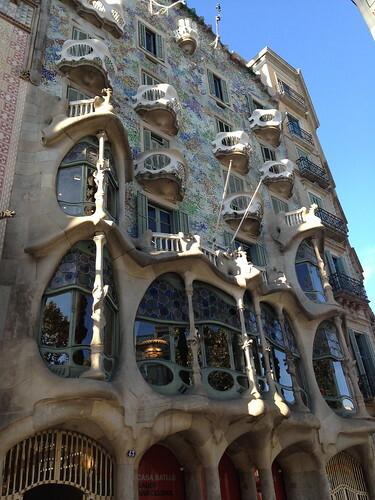 The second day we were supposed to go on a free walking tour at 11 am, but we managed to squeeze in a trip to the Casa Batllo, Gaudí’s other famous building, beforehand. 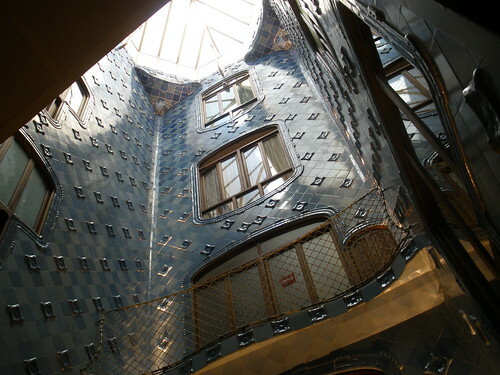 The building, which was originally a family home, has a beautiful floral facade, which is unique in and of itself, but, as with the Sagrada Familia, the inside was the best part. 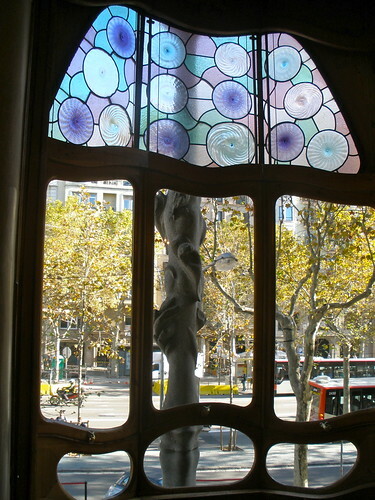 We toured the first floor, which was full of huge windows looking out to the street and beautiful stained glass, as well as the rooftop terrace. This might sound strange, but I do believe the stairwell, with its lightwell in the middle, was my favorite part. Essentially, the several flights of stairs progress up around a massive skylight that descends all the way to the ground floor. It’s covered in blue tiles and nautical-looking decorations, so I felt like I was in the underwater world of “The Little Mermaid,” which delighted my inner five-year-old self. After running through the metro station to catch our train, we made it to the tour departure point just as it was leaving. I don’t think we could have planned it better if we tried. 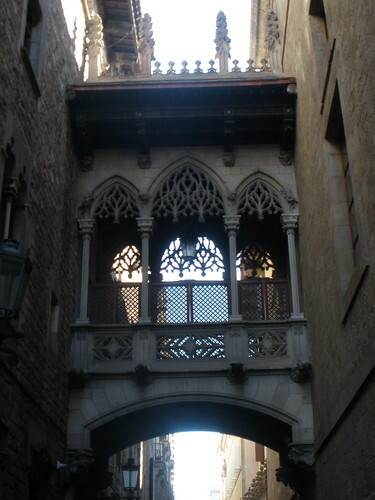 The tour guide took us on a three-hour trip through the Gothic Quarter of Barcelona, which was much different from the modernist parts we had been seeing but equally beautiful. 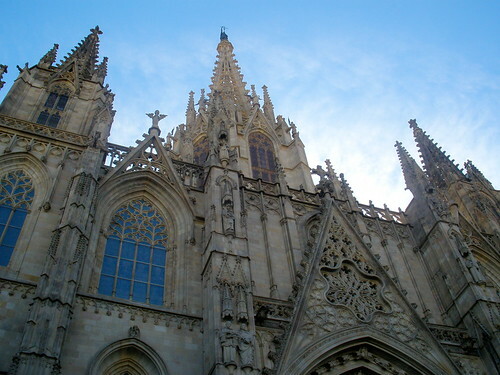 The tour was more for learning about history than seeing the sights, though, because Barcelona is far too big to see in three hours of walking. Still, I felt like I got a good sense of the city, especially when one of the girls on the tour got hit in the face with a soccer ball from the kids playing in the street next to us. 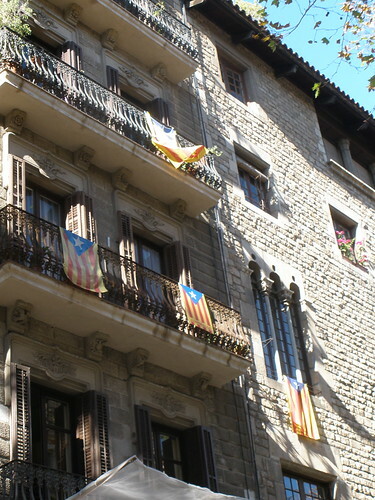 We learned all about Barcelona’s history, from its Roman roots to its communist history. 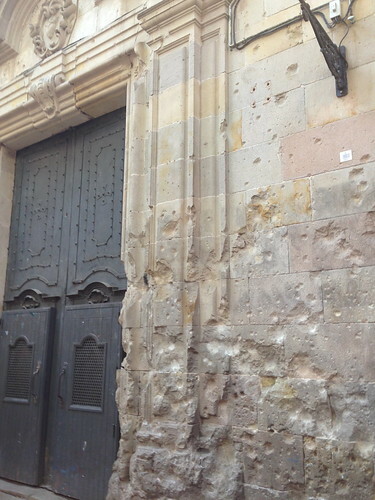 He even took us to a school that still had markings on it from when Mussolini bombed it and killed the 42 people taking shelter inside, some of them children. Although the communist influence wasn’t nearly as obvious as it was in Budapest, that square in particular gave me chills. Seeing kids playing outside it as if nothing had happened there was incredibly eerie. Our guide also told us that Barcelona has only been a major tourist destination since about 1992, when the Olympics were held there. Before that, it was apparently pretty run-down, but you’d never be able to tell now, except for the fact that all of the tourist organizations are relatively new. The walking tour, for example, has only been around for a few months. Their history isn’t over yet, though—the Catalonian people, who live in Spain but have their own flag and speak Catalan (although they also speak Spanish) still want independence. It’s always so fascinating to be in a place where something so monumental is on the brink of occurring—like the Scottish referendum or the Prague election for a new government—because it reminds me that the world isn’t just changing in the faraway Middle East. It’s changing here and now. Since our guide was also in a chef training program, he kept talking about Barcelona’s amazing cuisine, and I’m happy to say that we tried it all: tapas the first night, paella the second, and “pinchos” for lunch (essentially, self-service appetizers on toothpicks that are charged based on the number of toothpicks left over at the end of the meal). 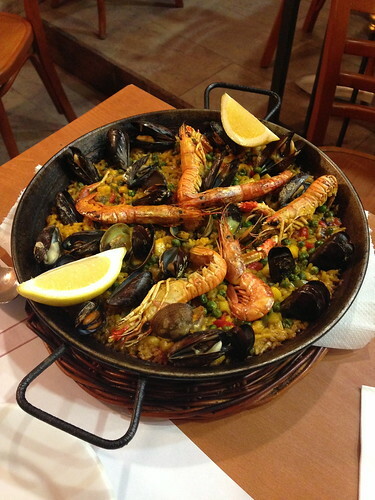 And, even though our paella was covered in mussels and crawdads and I usually hate fish, I decided to try it, because when in Barcelona… Happily, it was all delicious. To finish off our second day, we took the other line of the bus tour that we hadn’t done the day before. 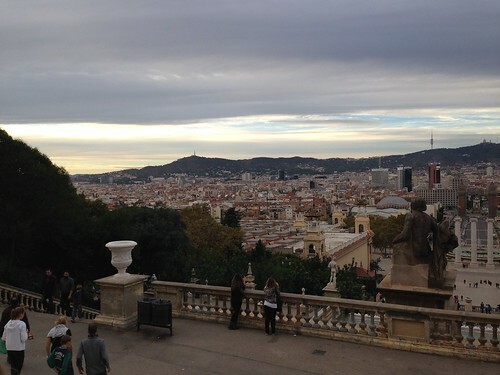 We only got off once to take a picture, but I realized just how massive and diverse Barcelona is. It was probably a two-hour bus ride, and this was only half of all of the city’s sights. It took us from the city center to the nearly suburban Olympic park to the harbor, and we even got views of the mountains, and it was all still Barcelona. It was completely unlike Prague or Edinburgh, which are completely walkable and look roughly the same wherever you go, but that made it even more fascinating to explore. The only thing I regret about this weekend is not using my seven years of Spanish more. Part of this is because, in the first taxi I took from the airport, I couldn’t understand a thing that was being said on the radio, and I thought I had lost it all. Before I found out this was only because it was in Catalan, I started speaking in English and found people happy to respond in it, so, even after I realized my mistake, I never really felt like I needed to push myself to speak Spanish. A few times, people spoke to me in Spanish first and I understood them, but I never really said anything more than “sí” or “gracias” in return. I regret it now, but I guess that just means I’ll have to go back. The most important thing I learned this weekend, though, is that you can’t pin down a culture to just one part of it. My fears that the only thing to do in Barcelona is go out and stay out all night were completely unfounded—there’s so much more culture and history, and the list of beautiful things to see is endless. Although we didn’t even experience that part of Barcelona (we were in bed by midnight at the latest both nights), I still feel like I saw Barcelona. If I’ve learned anything this semester, it’s that cultural stereotypes are just that—stereotypes—and there’s so much beyond them to explore. 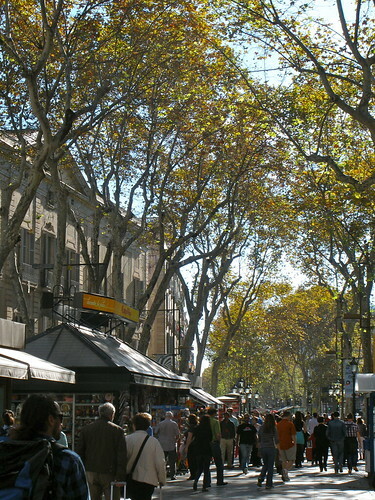 This entry was posted in Uncategorized and tagged Barcelona, Scotland, Spain, travel. Bookmark the permalink. I agree, I think you made the right choice. I’d like to travel around the world one day. Those buildings look amazing. Thanks for posting those pictures! 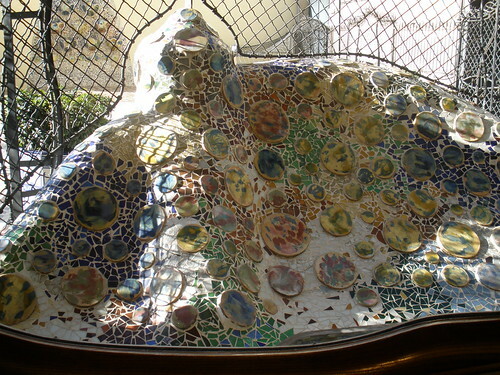 So glad you got to experience Barcelona – AND incorporate your memory of Little Mermaid. Way to go, Ariel !